Volkswagen currently builds the T6 Transporter van in Hanover. Ford likely will build midsize vans for Volkswagen in Turkey while VW will produce smaller vans in Poland as the two automakers jointly develop commercial vans to tap into a lucrative market that is too small for each automaker to effectively compete in on their own. VW Group CEO Herbert Diess said Ford's factory in Turkey that builds the Transit vans is "an option" for VW's Transporter midsize vans. Such a move would mean VW transferring production of its T6 vans from Hanover, Germany, to Turkey and the next Transporter moving to a Ford platform using Ford engines. VW is in discussions with labor representatives in Hanover about the change, Diess said on Tuesday, as Ford and VW announced details of their partnership. Germany's Handelblatt said VW likely will continue to build T6 passenger vans continue in Hanover while panel vans for businesses would transfer to Turkey. VW needs to free up capacity in Hanover after announcing in November that it will build the I.D. Buzz retro-styled minibus at the factory, with production likely starting in 2022. Ford and VW plan to launch vans in 2023 to replace the current Transit and the Transporter vans. VW will build a new compact van to replace both the VW Caddy and the Transit Connect at VW's plant in Poland, where the automaker produces the Crafter large van, Handelsblatt reported. The new van would use VW engines. Ford will build a midsize pickup to replace the VW Amarok to sold alongside a new Ford Ranger starting in 2022. The models will be sold in Europe, South America and Africa, the companies said. No production location was given. Ford currently builds the European Ranger in South Africa. Volkswagen Commercial Vehicles CEO Thomas Sedran said that "clear decisions" on production locations have not yet been made. To be competitive "the more production we have in the low-cost countries the better, and of course Turkey and Poland are both very competitive," Sedran said. Diess said VW and Ford would see similar savings from the commercial vehicle partnership by helping spread the cost of future technology and also making savings on product development. "It's mitigation against potential cost increases because of the new drivetrains we need for the electrification in this segment and also the CO2 penalties we are facing," he said. Unlike the slowing passenger-car market, demand for light commercial vehicles is on the rise. Global output will increase by 12 percent in the next five years, forecaster LMC Automotive says. The business commands higher profit margins. Ford has said profit margins on its European van range run at 13 percent. 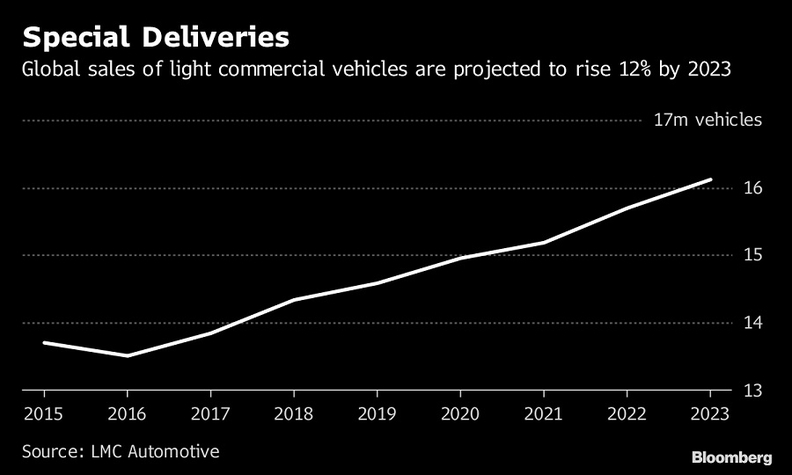 Together VW and Ford built 1.2 million light commercial vehicles globally last year and, as their scale increases, they could become the industry's highest-volume global collaboration in that market, the automakers said. 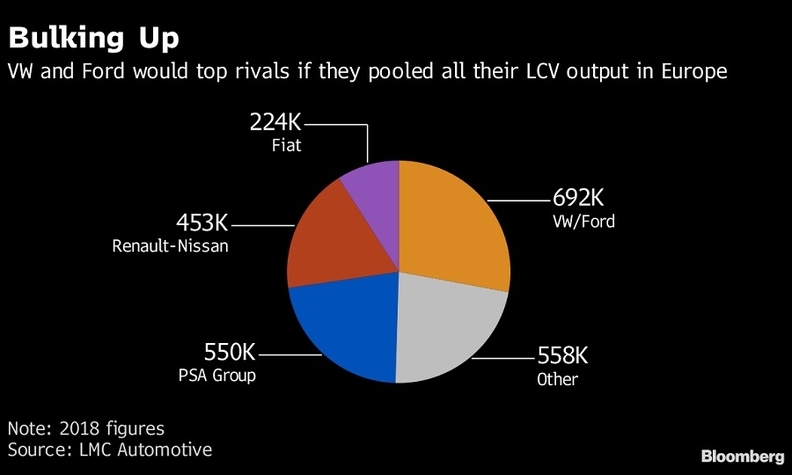 Ford's head of global markets, Jim Farley, said on Tuesday he expected Ford to make a pretax profit gain of $500 million annually by 2024 once the joint vehicles were on sale. 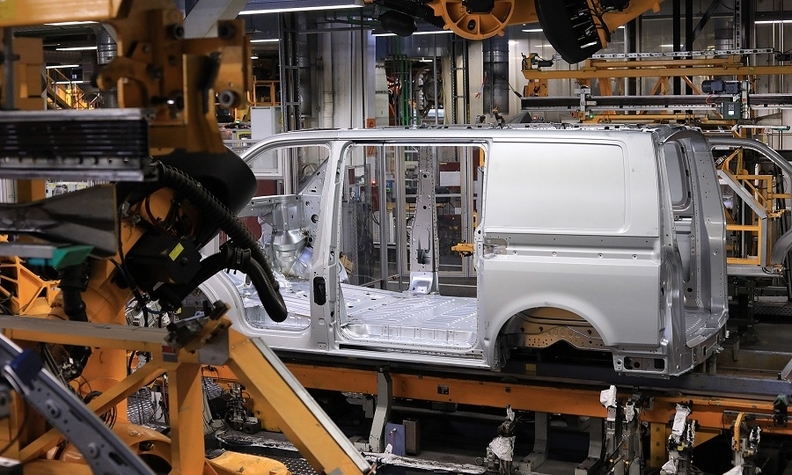 With VW taking over production of compact vans, Ford's factory in Valencia, Spain, would lose the Transit Connect, the only van Ford does not build for Europe in Turkey. The plant also makes the Mondeo, S-Max and Galaxy, three models thought to be under threat as Ford looks to cut unprofitable lines. Ford announced in 2017 an investment of 750 million euros for the plant to build the next-generation Kuga compact SUV. The current Kuga accounts for around half the output of the plant. Ford is making big changes in Europe including cutting thousands of jobs as it works to reverse losses in the region generated by its passenger car range.